Both singles will have a version of “Hare Hare Yukai” on them so it will be interesting to hear how each version differs from the original as well as the previous solo versions by the seiyuus of Haruhi, Mikuru, and Nagato. 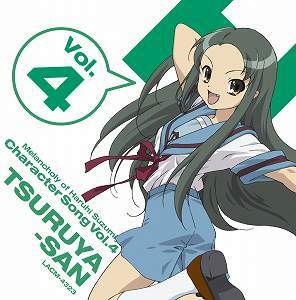 Tsuruya’s single (LACM-4323) will probably have a genki song (ooh, maybe involving smoked cheese!) and some kind of romantic song. 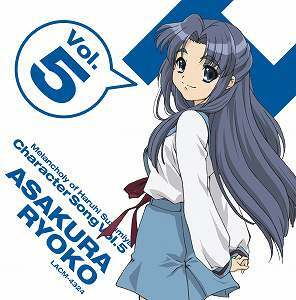 Ryoko’s single (LACM-4324) will also likely have a cute song and a slow ballad but I’d like it if there were a tragic love ballad along with a creepy fast-paced track to match the manipulative nature of Asakura-san. The seiyuu for Tsuruya, Yuki Matsuoka, has previously voiced Osaka (Azumanga), Rein (Gokujo Seitokai), Evangeline A.K. McDowell (Negima), and Inoue Orihime (Bleach). Other notable roles for Natsuko Kuwatani, the voice of Ryoko, include Fiore (Chrono Crusade), Yue Ayase (Negima), and Himeko Kudo (Get Backers). This entry was posted in Music, News, Suzumiya Haruhi no Yuutsu. Bookmark the permalink. If I see them around, I might go for them. If I can actually find them that is, not going to order online.